Tess Dombegh lives in Goredd, a Medieval-esque nation where women are meant to be perfect ladies, men are protectors, and falls from grace are expected to either be governesses or nuns. She decides to do neither and instead cuts off her hair to pose as a boy and take to the road. She is a prickly, angry young woman, and eventually joins the quigutl she had befriended as a child in search of the World Serpent. This search takes her across Goredd and Ninys, with various detours along the way. This is written in the same world as the 2012 novel Seraphina, which I hadn't read. 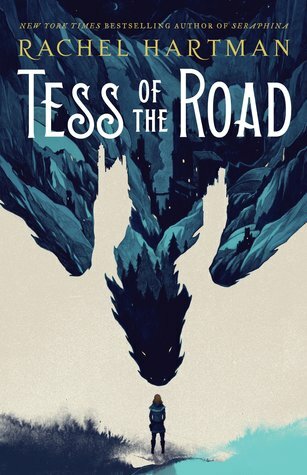 Even without reading that, Tess of the Road is able to be read on its own merit. In the beginning, Tess is angry, frequently drunk and bitter about being unable to please her critical mother, measure up to her perfect twin, or Saint Seraphina, who is able to break society's rules because of her heritage. While there is reason for it, we don't discover what her reasons are until much later on in the book. The discovery of her secrets occurs naturally and in spurts, so that we learn who Tess is as she does. That makes Tess difficult to get to know at times, so that could prevent some people from really getting into the beginning of the book. However, the travels are vividly described, and I was fascinated as much with the lands and creatures as with Tess's reasons to take to The Road. Because of the nature of Tess's trauma and how she goes about healing from it to become someone she can live with, this would not be a book for younger teens. I'm not sure what age group Seraphina was geared toward, but Tess being 17 at the start of this novel should be a good rule of thumb about its target audience. The real world is mirrored in this fantasy one, as many good fantasy worlds are: there are rigid gender roles and expectations in society, as well as biting commentary and consequences for the girls that don't follow them. Younger readers wouldn't understand those roles and the impact that it has on Tess and her family, or how the consequences played out. Sorry if this sounds very foreboding, as this is a very well written book and was a gripping read. I don't want to spoil the story or Tess's journey, because it's an important one for her to go on, and one that teens may appreciate.